Fundarc Communication (xgnlab): NGMN : 5G E2E Architecture framework; more on 'large scale convergence' at data plane. 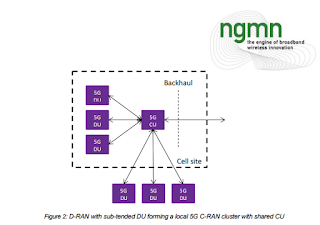 NGMN : 5G E2E Architecture framework; more on 'large scale convergence' at data plane. The 5G system will also support flexible RAN structures including implementations based on Cloud principles and the placement of context awareness at the RAN edges (i.e. mobile edge computing). Both centralized and distributed implementation of RAN functions should be enabled to facilitate the realization of various RAN implementations. In addition, support for various coverage layers and cell sizes spanning extreme long-distance covering macro cells to small cell radio access deployments is required. An open Perspective for LARGE SCALE CONVERGENCE, specially in case of data plane. RAN Decomposition, Functional decomposition of the radio network is required to meet the diverse information transport demands (high performance to low performance) and align them with the demands of next-generation service categories of eMBB, mIoT, and URLLC. To accommodate these, a decomposition of the radio network protocol layer functions, across layer-1, layer-2, and layer-3 is required, in terms of the degree of centralisation or distribution. This decomposition consists of placing more functions of the upper layers of the radio network protocol stack in distributed entities for high performance transport demands (e.g. high bandwidth, high-capacity, low-latency, low jitter etc.,) relative to a centralized entity. Scheduling optimisation at a centralized entity, for high performance transport across multiple distributed entities (e.g. base stations, remote radio heads etc.) for fast coordination is critical requirement. For relatively low performance transport, more of the upper layer of the radio network protocol stack is placed at a centralized entity to optimize the cost/performance trade-off, associated with the distributed entities. This choice of functional split will determine the x-haul capacity requirement and associated latency specifications and performance. This will impact the network architecture as it could determine the placement of nodes and distance between them or, in the case of a higher layer split, will be tolerant of a large latency from a RAN perspective which may be excessive when low-latency services are considered, therefore bounds must be applied within the network architecture to enable a service provider to support low latency services. A distributed RAN (D-RAN) with several functional splits will be supported by 5G. Figure 1 illustrates the configuration with co-located centralised unit (CU) and distributed (DU). All radio protocol layers are terminated within the cell site. The connection from the cell site towards the core network is traditional mobile backhaul which will be scaled and optimised to support 5G data rates and performance targets such as low-latency, low PELR, low and very deterministic PDV etc. 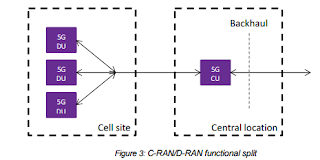 The D-RAN configuration does not constrain the ability of the local CU to support remote DU; in fact the cell site could become a CU for other cells sub-tended as illustrated in Figure 2. A 5G C-RAN can be implemented with a higher layer split with the protocols stack with PDCP being located in the CU while the remainder of the stack is in the DU, as shown in Figure 3. This is one example; other splits will result in a different distribution of functionality between CU and DU. This configuration has similar x-haul capacity requirements when compared with traditional backhaul, the latency and performance requirements of the RAN are not stringent and therefore consideration must be given to engineer the x-haul link in accordance with service-based latency and performance targets.